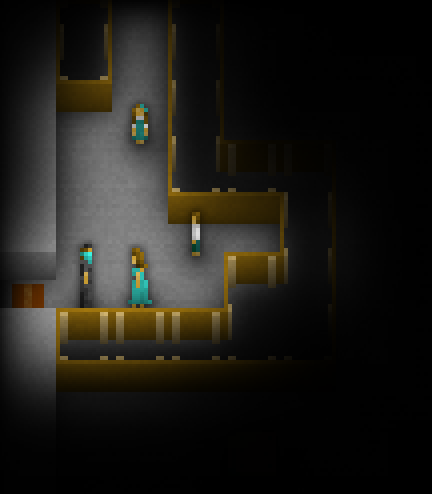 Something has been missing, both mechanically and thematically, from The Castle Doctrine. First of all, though the castle doctrine (the in the legal sense) is a very old idea, our modern discourse around it generally centers on the right to shoot an intruder with a gun. Of course, so far, there have been no home-defense guns in my game. In fact, home defense has been an entirely indirect, hands-off, automated affair. You set up mechanisms to trick, trap, and kill intruders, but you never shoot them. You come home later and watch security tapes to find out how well your contraptions worked. The game works this way because you're not home when intruders come in, and you're not home when intruders come in for a variety of good design, technical, and thematic reasons. But someone else is home when intruders come in: your wife. So far, the wife has been somewhat unsatisfying both mechanically and thematically. Yeah, she earns money outside the home, making her a valuable mechanical asset. But when a robber comes in, her interaction consists of hiding until she spots the intruder and then running along the shortest empty path to the door. The empty path requirement is important for technical reasons (otherwise, if she could interact with your traps on her way out, the server would have to verify a viable interactive path for her, which I believe is an NP-hard problem). It also adds a nice texture to each house, because you have to design different sections for the house with different styles---a heavily mechanical part surrounding your vault, and a smoother, more hospitable part surrounding your family. But the empty path requirement also means that your family protection options are quite limited. You can put dogs in clever places along the family's exit path, but that's it. And thematically, when a robber comes in, the wife is completely passive. This seems like a commentary about the different roles of men and women when a family is under threat, and it is, to some extent (as a man, I have felt a stronger family protection pressure placed on me when things have gotten dicey). But I think the setup in the game is too stark, and it's missing some important aspects of the truth, as I see it. Women that I know, when under threat, are willing to arm themselves to overcome inherent physical disparities. My wife is no exception. In fact, she had pepper spray in her backpack twenty years ago, before I met her. And what about guns? Well, they're by no means an exclusively male concern. I'm not exactly immersed in gun-owning culture, but out of the self-defense gun owners that I have met, quite a few have been women. I'm reminded of my scrappy, ex-nun aunt Ginner, who used to go camping alone in the national parks packing a .38 special revolver. And my experience matches the data, because nearly one in four U.S. women is a gun owner. But what kind of gun is appropriate here? I recall talk show radio host Michael Savage saying something zany like, "A shotgun is your best friend in a darkened bedroom." And when I lived in New Mexico, our neighbor across the street had a shotgun as her home defense weapon of choice ("Dude, when it's nighttime, and you can't see nothin', you don't need to aim it---just point and shoot, dude," her husband explained to me). And a shotgun is mechanically rich, because it's deadly only at close range, so it provides a nice mechanical contrast to the handgun potentially carried by the robber. 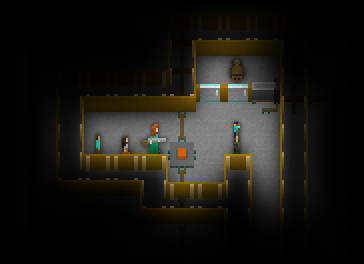 I also added a way for the family members to interact with the other mechanical aspects of the house, somewhat indirectly: they now have a panic button that they can press on their way out, and that button can connect into whatever house circuitry the owner devises (opening the trapdoors, releasing the dogs, and so on). My wife actually had panic buttons in her house when she was growing up. Tammy used to be a victimization waiting to happen. Now she's Jodie Foster in Panic Room. Although I feel the shotgun has interesting thematic implications, I don't think it currently has enough in game utility to be an interesting game element, especially where family defence is concerned. Killing the wife has always been about shooting your way through pit bulls. All the shotgun does is mean you have to bring one more gun along, and it costs just the same as a pit bull. It was a little different when she had a free move when the screen shifted - then she could kill you as soon as she saw you - but now a single gun is a hard counter to the shotgun. Now as far as I can tell the panic button is also useless when it comes to family defence. There always has to be a clear path leading to the family so the only thing it can be used for is releasing pit bulls as is in your example above. The problem here is that it makes a lot more sense to put the dogs directly on the path to your family. You never want the robber to see the family in the first place - if they have a gun then your wife is dead. So the only interesting uses of the shotgun and panic button are for putting your families lives on the line in order to defend your vault/collect bounties. A clever wife + shotgun based defence might kill off a few robbers, but an hour later you will see them back again, gun in hand seeking revenge and then good-bye wife. The only place where such a defence might be safe is towards the end of a large house, but this is still very risky as someone who has gotten that far might have brought along a gun with the rest of their tools, especially if this kind of defence becomes common. The panic button only gives a number of small advantages over a cat run and at the price of putting whoever presses it at risk. If a robber sees a family member and has access to the front door they can now wait there until this person appears and club them (or shoot them if they are a wife with a shotgun). The advantages are that you can make extremely long runs as compared to cats and that the buttons can't be pressed by the player. 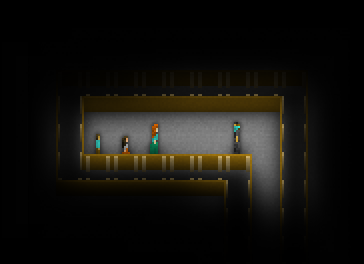 Still, the major use of the panic button for me is creating a square that the player can walk on but pets can't. I like the inclusion of the shotgun and will always give my wife one but I think for the thematic content to really sink in it should also be linked into the game as an interesting, useful game element. I'm not sure the best way to do this, perhaps increasing the range of the shotgun or increasing the price of the gun? With the second option you could add in a new tool for getting past dogs that doesn't work on the wife. It sounds like the gun's range is a bit too long.... 16 tiles is pretty huge, and makes the gun tactically uninteresting. You can walk into the center of a room and effectively shoot everything in sight without taking a single step. HOWEVER.... I'm a bit concerned that by weakening the gun's reach, I will somehow enable truly-impossible houses.... though I guess not, because you could always lure dogs closer before shooting them. I'm not sure that drugged meat needs to be nerfed. You're creating landmines, after all. The handgun could do with a nerf of some kind though. Maybe firing it passes your turn? Y'know, so you can't simultaneously shoot three people and five dogs. Well, my point was that a range reduction would have that effect (without changing the way that turns pass while using tools). You couldn't shoot 3 people and 5 dogs on a single turn, because most of them would be out of reach. You'd have to walk around to reach the others, during which they'd all be moving around. It would also mean that you could see the family without necessarily being able to shoot them on sight. If the handgun range were two, wives with shotguns would be genuinely useful - with the right spacing, she could chase even a gun-toter down a corridor. Combined with panic buttons to release well-placed dogs, this could be interesting. Gun with a range of 2 would be very interesting. It would allow for more area control of your house and create some nice tension. However I am not sure about nerfing the meat range. Firstly, it doesn't require great aim to throw a piece of meat, and secondly it just isn't as effective as a gun. Yeah, I think I would keep meat and brick range the same. Will play around with a gun range of 2 and see how it feels. Range 2 for the gun will make the shotgun very powerful for wife defence. I'm able to come up with a defence using only walls and the shotgun where the only way to kill the wife is to bash through at least 3 walls and then shoot her with a gun. So that is a minimum of $4800 to kill her assuming concrete walls. And this for the price of 2 pit bulls. One advantage of this is that when using the wife to defend the vault a robber can't just come in with a gun from starter cash and get her, so she might become more viable as a defensive option. On the other hand it might simply make wife defence too easy. The strength of the panic button over a cat run is that family members can walk a complicated path while cats/dogs can only run towards/away. What about glass windows btw? Can you one-shot a wife through a window? If so, I say keep it simple and just make it so that you first have to shoot out the window, and make that take one "move". Bingo.